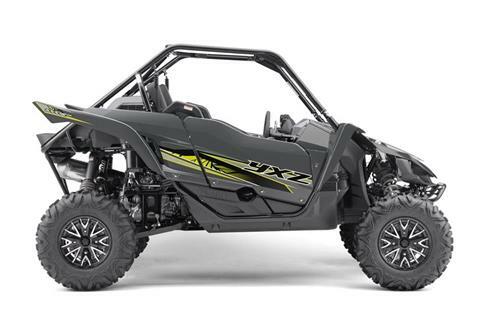 The YXZ1000R SS puts pure sport performance at your fingertips with a 5-speed sequential Sport Shift (SS) transmission and automatic clutch. STUNNING, INDUSTRY-FIRST THREE-CYLINDER ENGINE: Designed to bring a Pure Sport riding character like nothing else in the side-by-side world, the YXZ1000R SS engine was built to deliver high-revving power with the flexibility and character that only an inline triple can provide. With a compact, counterbalanced, DOHC twelve-valve cylinder head, an aggressive 11.3:1 compression ratio and dry-sump lubrication, the YXZ1000R SS engine offers jaw-dropping power, fantastic midrange torque and a thrilling 10,500 rpm redline. For 2019, new high strength connecting rods provide the durability Yamaha is known for—even under the demands of high-output modifications like turbocharging. NEW COOLING SYSTEM: The YXZ1000R SS is built to blow away the competition in every terrain, from desert dunes to muddy trails. 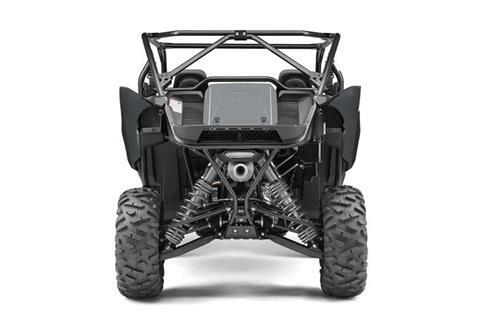 To ensure peak performance every ride, the 2019 YXZ1000R SS features a new rear-mounted radiator: this system not only reduces heat in the cabin, it remains clear of mud or debris build-up, and is designed to funnel cool air through the radiator at low or high speeds equally well. EXCLUSIVE 5-SPEED SEQUENTIAL TRANSMISSION: Pure Sport is not just about engine output—engaging the driver is just as important. And nothing in the side-by-side world can match the feeling of banging through the gears using the YXZ1000R SS’s Sport Shift, a sequential 5-speed manual transmission featuring Yamaha Chip Controlled Shift (YCC-S) technology. This system combines the power, durability and efficiency of a traditional manual transmission with an advanced automatic clutch system controlled with sporty paddle shifters mounted to the steering column. Sport Shift offers a high-tech riding experience that anyone can enjoy, with rapid and precise gear selection literally at your fingertips. For 2019, the transmission also features newly optimized gearing that gives the YXZ1000R SS even more flexibility to handle nearly any type of trail, from wide-open desert roads to first gear crawling. HIGH FLOW INTAKE AND EXHAUST: Any engine needs to inhale clean air and exhale as efficiently as possible. YXZ1000R SS’s high capacity intake system features dual air filters—one oiled foam, one viscous paper—affording maximum airflow to the engine as well as durable filtration for the dirtiest riding environments. The three-into-one high-volume exhaust system centralizes weight distribution and is tuned to provide maximum power across the rev range. YAMAHA'S EXCLUSIVE ON-COMMAND 4WD: On-Command 4WD gives the driver ultimate traction, with easily selected 2WD, 4WD limited-slip, and 4WD full diff lock modes. 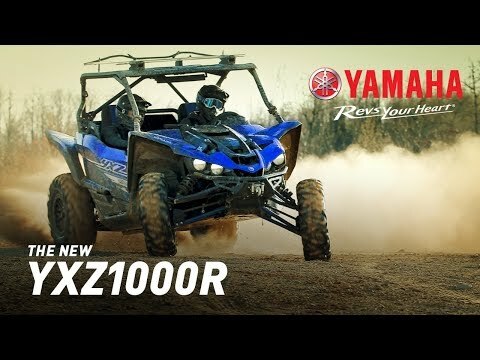 The YXZ1000R SS drivetrain incorporates Yamaha’s proven On- Command 4WD system to tackle the most challenging terrain. To deliver Yamaha’s exceptional durability, this system also incorporates an over-torque protection system that eliminates spike loads to the front drive case on hard impacts, protecting it from damage without affecting performance. TERRAIN CONQUERING, FULLY-ADJUSTABLE FOX SHOCKS: Rising defiantly through the front hood and defining the rear of the vehicle, the YXZ1000R SS’s FOX® 2.5 Podium® RC2 Shocks with huge piggyback reservoirs bring visual impact and unmatched performance. All four corners are fully adjustable—spring preload, rebound and both high- and low-speed compression damping—with a huge 16.2 inches of front travel and 17.0 inches at the rear for exceptional ride quality, tuneability, and handling. PURE SPORTS CHASSIS: The YXZ1000R SS the best handling sport side-by-side on the planet, period. The YXZ1000R SS attacks corners with agility, light steering feel and straight line stability across the roughest terrain. High-end spherical-joint double A-arms retain ideal castor angle and bump response throughout the entire travel range, and front and rear sway bars minimize body roll for flatter, more responsive cornering. And underneath the optimized frame geometry, full-frame composite skid plates protect against rocks and debris. 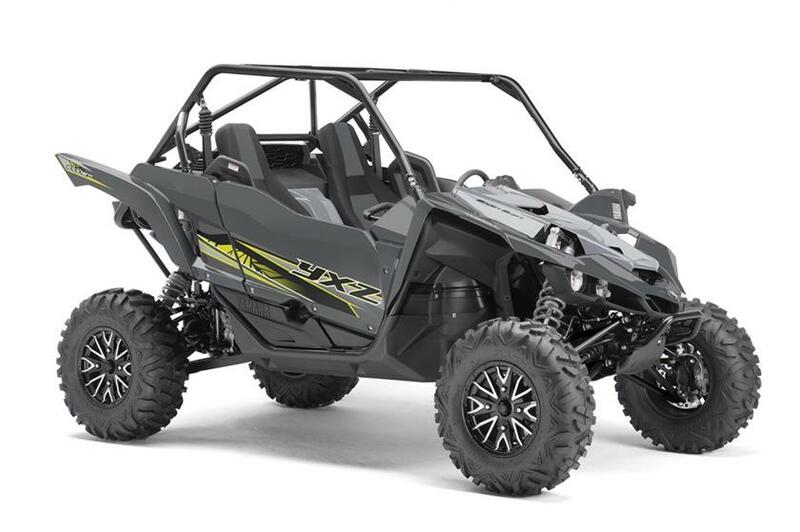 YAMAHA ELECTRIC POWER STEERING (EPS): The YXZ1000R SS features Yamaha’s class-leading speed-sensitive EPS, for reduced steering effort and precise handling in virtually all conditions. The EPS unit is lightweight and compact, mounted high on the new rack-and-pinion steering system, further protecting it from dirt and debris. POWERFUL ALL-WHEEL DISC BRAKES: The YXZ1000R SS offers improved braking control for 2019 thanks to twin-piston calipers clamping down on large 255mm rotors at all four wheels, for excellent braking power, feel and fade-resistance under hard use. An automotive-style parking brake lever is mounted in the cabin’s center console. 29-INCH MAXXIS TIRES: New for 2019, the YXZ1000R SS now mounts larger 29-inch Maxxis® Bighorn® 2.0 radial tires that offer extreme performance, with increased ground clearance, optimum traction, durability, comfort and steering precision. These tires are mounted to strong yet lightweight 14-inch alloy wheels. AGRESSIVE STYLE: Radical styling shows off Yamaha’s passion for powersports. And form follows function, as the front suspension design permits an extremely low hood line for excellent trail visibility. 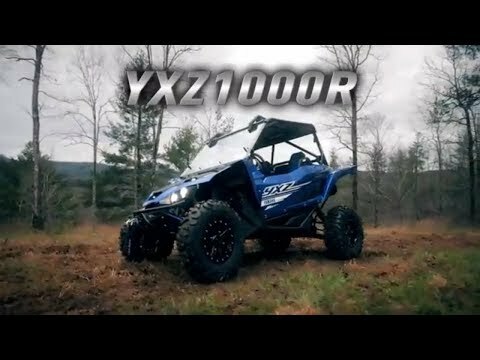 For 2019, the YXZ1000R SS is sharper and sportier than ever. ERGONOMICS BUILT FOR PERFORMANCE: The YXZ1000R cab features plush, high-back seats with extra lateral support and outside shoulder bolsters, and the cockpit provides a balance of driving confidence with comfort. Shaped floorboards provide generous legroom while still giving a planted feel during aggressive driving, and both the driver’s seat and steering wheel are adjustable to ensure a perfect fit. Improved cabin insulation keep you cooler when blasting across the hottest summer days. SUPERSPORT-STYLE DASHBOARD: The YXZ1000R features instruments inspired by Yamaha’s high-performance supersport motorcycles. Functions include a digital speedometer, analog tachometer and programmable shift light, with readouts for 4WD mode, gear position, fuel level, trip meters, hour meter, coolant temperature warning and a clock. COOLER RUNNING CABIN: Drive hard and keep your cool. The all-new rear-mounted radiator significantly reduces cabin heat compared to a conventional forward-mounted cooling system. Plush Suspension: While the high-end Fox® suspension on the YXZ1000R SS is primarily focused at maximizing adjustment range for aggressive riding, that same range of adjustment adds flexibility, too. 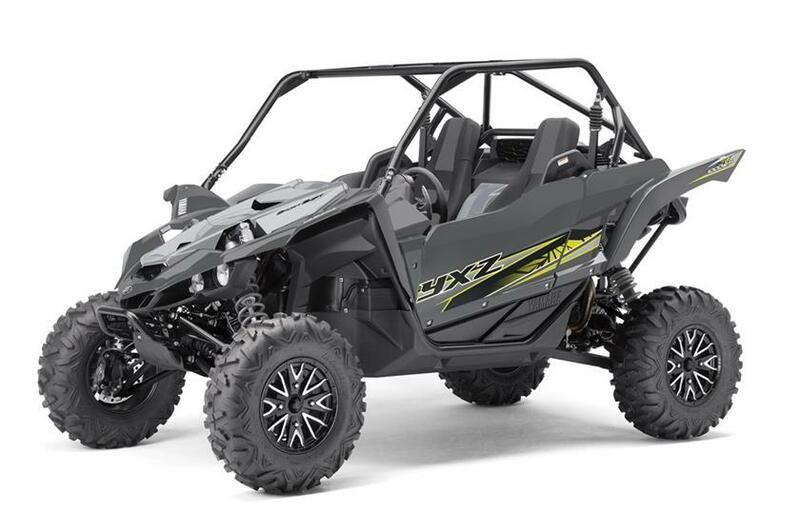 With a couple of quick tweaks, the YXZ1000R SS can be tuned to deliver a plush, smooth ride that defies the idea that sport and comfort can’t coexist. ASSEMBLED IN THE USA: The YXZ1000R is proudly assembled in Newnan, GA, for world-wide distribution and is built to be Real World Tough™. AGGRESSIVE LED LIGHTING: Four super bright and long-lasting LED headlights provide brilliant forward illumination and give the YXZ1000R a sinister sense of style, with a bright LED taillight for extra visibility. 300-POUND CARGO CAPACITY: Bring what you need thanks to a composite cargo bed with a 300-pound capacity and four steel tie-down points. A sealed compartment next to the cargo bed and glove box in the cab provide additional storage, as do passenger-side cup holders and a central storage tray in the dashboard. NEW POWERTRAIN: The YXZ1000R SS proved its Pure Sport performance time and time again. For 2019, a range of enhancements push the envelope no matter where you drive. Drivers looking to tear up gnarly woods and trails will appreciate the lowered gearing with a tighter first gear, ideal for technical riding and sharper torque right off the bottom. And folks looking to blast through the desert will love the beefy new engine internals, which makes adding Yamaha’s turbocharger kit easier than ever. NEW COOLING SYSTEM: Big power means big heat, so for 2019, the YXZ1000R SS uses an all-new cooling system that not only ensures proper cooling during the toughest conditions, but is designed to ensure the cabin remains comfortable and the radiator stays clear of mud and debris. 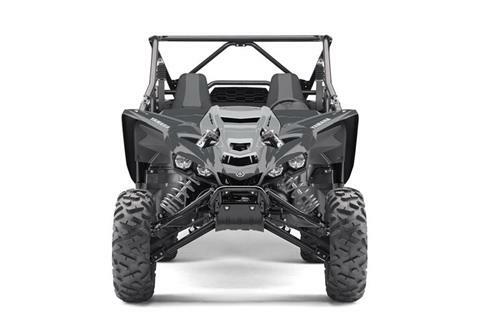 NEW WHEELS AND SUSPENSION: To ensure the YXZ1000R SS is able to make the most of its roaring three-cylinder engine, the driver needs to get traction across a range of conditions, so the 2019 YXZ1000R SS brings updated suspension settings to control the larger 29-inch Maxxis® Bighorn® tires for exceptional grip. LARGER ALL-WHEEL DISC BRAKES: The YXZ1000R SS offers fantastic braking thanks to upgraded, larger-diameter rotors for 2019. These improved brakes increase maximum braking and boost feel for superior deceleration. ENHANCED STYLING: Goes fast, looks fast. An updated frame underpins sharper styling from nose to tail, while still ensuring class-leading driver visibility with the aggressively low hood design. THE ULTIMATE PURE SPORT SxS: Upgraded for 2019, the YXZ1000R™ SS is the most focused high-performance side-by-side in the world. 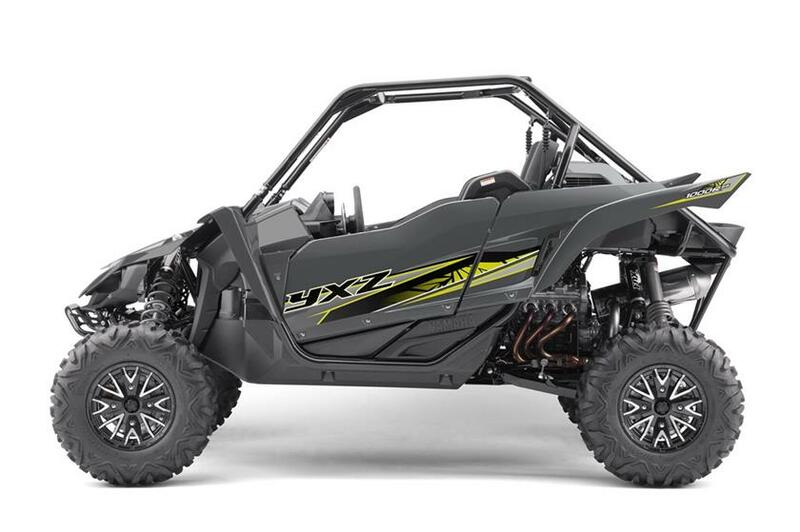 Changes to nearly every system on board ensure that the YXZ® brings this level of performance to every ride, no matter the terrain, from dunes to desert, tight woods and muddy trails. UNIQUE ENGINE WITH SPORT SHIFT TRANSMISSION: Just as powerful and exclusive as when Yamaha unveiled the first YXZ1000R SS in 2017, the 2019 YXZ1000R SS features a high-revving, high-output inline-triple engine mated to Yamaha’s Sport Shift, a sequential 5-speed manual transmission featuring Yamaha Chip Controlled Shift (YCC-S) technology. The result is a Pure Sport driving experience unmatched by anything on the market. HIGH-SPEC CHASSIS: Big engines make headlines, but it’s the chassis that does the real work. The YXZ1000R SS flatters its driver with one of the most agile, adjustable and capable side-by-side chassis designs ever seen in a production side-by-side. DRIVER-FOCUSED ERGONOMICS: Comfort is control when driving hard, and the YXZ1000R SS is built around this concept. The driver and passenger are kept low in the chassis, with exceptional visibility. The cabin offers roomy high-back seats with plenty of adjustability for the driver. YAMAHA ENGINEERING: Not only does the YXZ1000R SS come standard with Yamaha’s famous reputation for reliability, it’s also assembled in the USA and engineered with a full range of factory accessory options, so that not only can you customize a YXZ1000R SS to your needs, you know it will meet and exceed your expectations for years to come. Rear rack - 300 lb.